After nearly a decade’s worth of research and breeding efforts Rutgers Downy Mildew Resistant (DMR) sweet basils are now available to commercial growers with seed for homeowners and gardeners becoming available in 2019. Since 2007, when basil downy mildew (BDM) was first identified in FL, the disease has caused significant economic losses to commercial basil growers throughout the United States, and has made growing sweet basil in the backyard garden nearly impossible. Since 2009, Rutgers has been working diligently to identify and breed downy mildew resistance into commercially-acceptable sweet basils that have the correct aromas, essential oils, and flavors. The first of these three new DMR sweet basils are now available through VanDrunen Farm Specialty Seed (VDFSS) located in Thermal, CA and Momence, IL. Each of the new Rutgers DMR sweet basils have their own unique characteristics which can be matched to meet grower needs. Rutgers Obsession DMR: An excellent sweet basil for field or potted plant production; will also make an excellent edible landscape plant; more compact, slower growth than Devotion DMR and Thunderstruck DMR, high leaf-to-stem ratio – good for small bunches or small size clam shells, dark green, thick, glossy leaves, flowers form late; and highly resistant to Fusarium wilt. 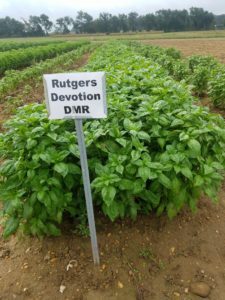 Rutgers Devotion DMR: An excellent Genovese-type sweet basil for field production for fresh markets; establishes quicker than Obsession DMR with uniform, upright growth, dark, green color with flat to cup-shaped leaves. 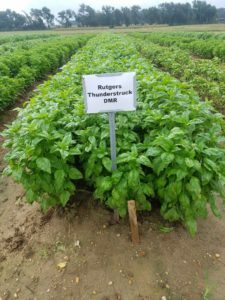 Rutgers Thunderstruck DMR: An excellent sweet basil with high yields needed for processing- and fresh-market production; quick establishment and fast, upright growth with medium-sized, ruffled leaves with a bright green color. 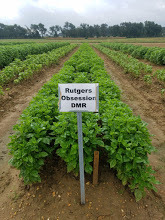 For more information on Rutgers DMR sweet basils please contact VanDrunen Specialty Seeds in the link above. 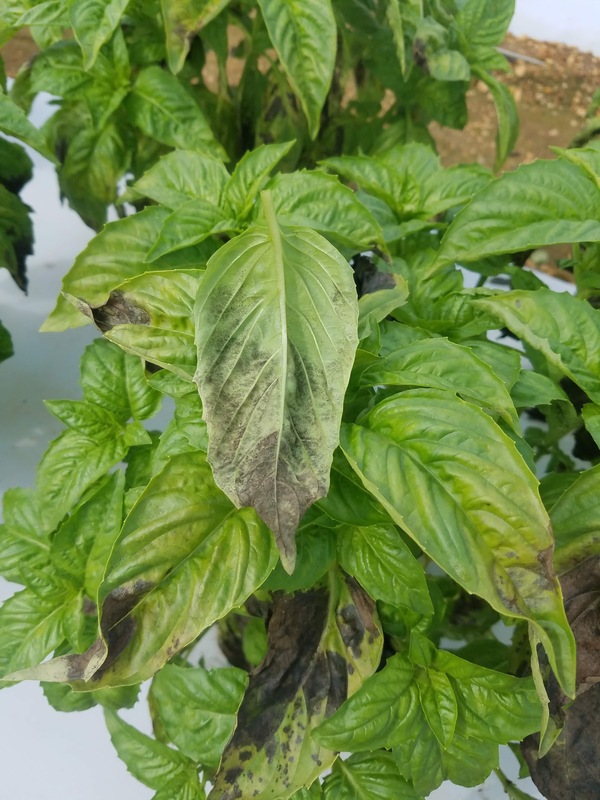 For more information on basil downy mildew, our research, and our new DMR sweet basils follow us on Instagram at #RutgersBasil. Basil downy mildew has been confirmed on field-grown basil in southern and central New Jersey on 6/29/16. This is the first report of the pathogen in New Jersey and the mid-Atlantic region this growing season. All basil growers are encouraged to scout on a regular basis and initiate a protectant fungicide program if one hasn’t been started. For the past 6 years, Rutgers has led efforts in the breeding of sweet basil for resistance to downy mildew. Currently, basil downy mildew threatens 100% of the basil acreage in the US and other parts of the world. Rutgers University, along with researchers at Michigan State, University of Florida, Oregon State University, Cornell University, California State University, and North Carolina State University as well as the USDA Agricultural Research Service have been awarded a $2.3-million USDA grant to help fight downy mildew in a number of highly valuable crops. The announcement from MSU who leads this effort can be found on MSU Today. Basil downy mildew (Peronospora belbahrii) has been found in a field near Vineland, New Jersey. This is the first report of downy mildew in field-grown basil in New Jersey this year. All basil growers need to scout on a daily basis and initiate a preventative fungicide program.